Thanks to a grant from the Ministry of Culture and National Heritage and the Marshal Office of the Malopolska this year the Diocesan Centre for Orthodox Culture “Elpis” in Gorlice realized a maintenance project of Cyrillic old prints. Orthodox Cultural Centre “Elpis”, set up to operate in 2000, has chosen as one of the main goals of his actions securing and protecting the rich material heritage of the Orthodox Church on the Sub-Carpathian and Galicia regions. Since 2010, the Centre, has among others taken stock and catalogued old Cyrillic books held by the Orthodox parishes in the province of Malopolska. The next step was to enter the most valuable volumes in the register of vintage objects and raise funds for their maintenance. Today the centre is in possession of more than 30 books (mostly from 17th and 18th centuries) which have obtained during the period of its operation. 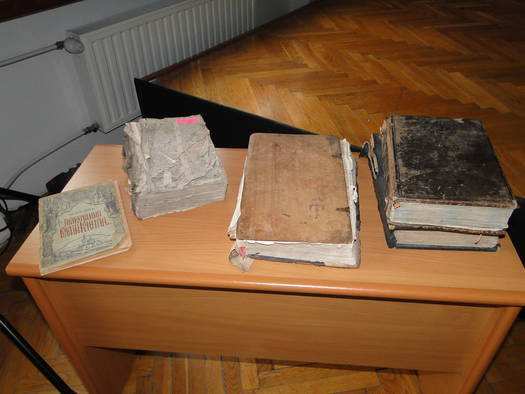 The largest part of a collection are books donated by the Ordinary of the Diocese of Przemysl and Nowy Sacz Archbishop Adam, who for many years has been collecting old books to protect them from extinction. This year’s project took over maintenance of two Orthodox prints. Restoration works were done with “Holiday Minea”, published by in Lviv Bracka printing in 1638 and “The Apostle”, also released in Lviv Bracka printing in 1696. The objective was to save objects before progressive destruction and restore their original appearance. Maintenance helped to protect, preserve and fix the substance of books. The objects have been also bound. At present, their state will allow the display in the exhibition hall of Orthodox Culture Centre in Gorlice. Conservation program provided included: disinfection, cleaning cards from dust, dirt, cards’ baths in hot water to remove impurities from paper, stains and raise the pH rate of paper. Losses were supplemented, many tears were glued, frames were reconstructed. Books got protective packaging. The total cost of the work amounted to 60,000 PLN. Renewed books were among the most damaged volumes of the collection. These objects are all the more valuable because they come from churches, which have not been preserved until now. There are donation entries at the margins of the cards with valuable information and may be the only surviving mementoes of these objects. Books are also characterized by a high artistic value. They contain beautiful woodcuts, initials and ornaments.